There has been much discussion about securing the water future for Marin County. MMWD is our main water district and through them we procure 75% of our water from our local watershed. We import 25% of our water from outside the county. The average MMWD client uses 140 gallons of water per person, per day. In 2009 Sustainable Fairfax received a grant for a Water Conservation Project with the Marin Municipal Water District (MMWD). We surveyed the town to assess and offer behavioral and technological ways to reduce water use. 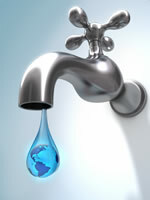 Our goal is to create a Model for community inspired Water Conservation for residences, schools and businesses.